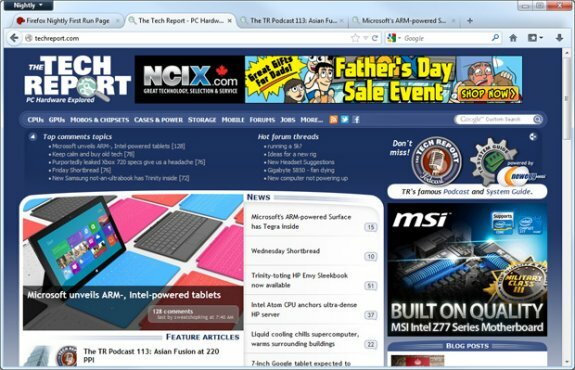 The Tech Report noticed the latest nightly build of Mozilla's Firefox browser has adopted the new "Australis" user interface (which looks a lot like the UI of Google's Chrome). The new Firefox design seems to blend background tabs completely into the window frame—unless, that is, the mouse cursor is hovering over them (as it is on the left-most tab in that screenshot). Still, the tabs-on-top layout with curved tabs is clearly inspired by Google's design, which has stayed largely unchanged since the first public Chrome beta came out four years ago.